John Wells’s phonetic blog: st- or sd-? LPD Welsh items "sd" involves fortis and lenis paired in a syllable onset. Is this feasible and if so what other language does it? Welsh [sd] is by analogy with [sb] and [sg] reflected in the spelling. The plosive is unaspirated in this environment. In LPD I give the Welsh-language pronunciation of Aberystwyth as a ber ˈə sduɨθ. In English, on the other hand, it is ˌæb ə ˈrɪst wɪθ. Jack wants to know why I transcribe the last syllable in the Welsh form with sd rather than st. Behind this decision there is a chain of reasoning. It is a commonplace to point out that in English (and various other languages) the opposition between the voiceless/fortis series p t k and the voiced/lenis series b d g is neutralized after s. The putative p in English spin is typically unaspirated — like b but unlike most other cases of p. Every now and again someone has the idea of arguing that this word should correctly be transcribed as sbɪn rather than spɪn. The same applies with the initial clusters in stop (sdɒp?) and skip (sɡɪp?). If someone wants to transcribe English this way, I find it difficult to argue forcefully against the idea. And even when the s and the plosive are putatively in different syllables there may be something very close to a neutralization: think about discussed and disgust. A fortiori, in languages such as Welsh, Scottish Gaelic, or Icelandic, where the main distinguishing feature between the two plosive series appears to be aspiration rather than voicing, the analysis as sb sd sg seems justified. Inconsistently, though, at the alveolar place Welsh spelling has st rather than the sd you might expect. We have tyst ‘witness’, llestri ‘dishes’, straeon ‘stories’, while English strike is Welsh streic. But phonetically these clusters correspond exactly to those with the bilabial and velar plosives, so it is only logical to analyse them the same way. These results show clearly that in terms of the aspiration feature, the feature that carries the main acoustic cues for the distinguishing of the fortis stops from the lenis, these stops in /s/-clusters should be classified as lenes, as shown in the recommended transcription […] /sb, sd, sg/. Jack also asks “what other language does it?”. 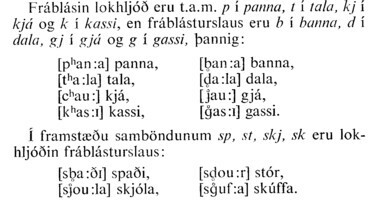 Here’s a scan from a book on Icelandic phonetics (Árni Böðvarsson, Hljóðfræði, Reykjavík 1979). I assume that fráblásturslaus means ‘unaspirated’. Before someone points it out, I immediately concede that for consistency in LPD I ought to have transcribed the Welsh pronunciation of Llanrwst as ɬanˈruːsd rather than what I actually put, ɬanˈruːst. Ach-y-fi! Every now and again someone has the idea of arguing that this word should correctly be transcribed as sbɪn rather than spɪn. AFAICT the main reason why this isn't done is spelling (in Italian [ɱ] -- occurring only before /f/ and /v/ where no other nasal is possible -- is usually considered an allophone of /n/ rather than of /m/ because it's spelt m, etc. ), though I'd like to know what natively-English-speaking supersymmetry scholars pronounce sdown and sbottom (/zdaUn/ maybe?). If we really wanted to find a totally spelling-independent criterion, ask someone to read a text containing words such as spin, record it, isolate the words, strip the initial fricatives away, play them back, and ask them to tell whether they sounds more like pin or bin. But I wouldn't be surprised if they answered about 50% of the times with the fortis consonant and about 50% with the lenis one. I meant “because it's spelt n” of course. I may be deluding myself, but I fancy that I have a three-way opposition of voice-onset times between "this pin", "this spin" and "this bin". @VP - you could always record yourself and run the recording thru PRAAT? @VP - treating /p/ as [b] after /s/ and [pʰ] elsewhere (i.e. neutralising the p-b distinction after /s/) still preservers the three-way distinction. Whenever I have tested unaspirated [p t k] with native speakers of AmE, they invariably hear them as /b d g/ and never as /p t k/. I should like to know further why that sd is in the last syllable rather than the previous one, where you have put the st for the English pronunciation. You are happy with the sd in the coda for the amendment ɬanˈruːsd you have now given for ɬanˈruːst. Would you similarly treat your example llestri as ˈɬesd ri? For Ystwyth in LPD you have ˈʌst wɪθ parallel to your syllabification for Aberystwyth, but ˈəs duiθ, -duɨθ for the Welsh. And twɪθ is a phonological possibility in English, accounting for aspiration in (Aber)ystwyth. Assigning the t to the previous syllable might suggest that it can finish up as in the dʌs tə dʌs of your family funeral. Similarly I think the presence or absence of aspiration is what pretty consistently distinguishes your pair "discussed" and "disgust", because they're not initial clusters, and if they are ever completely undistinguishable I would call it homophony rather than "something very close to a neutralization". The initial cluster in "scut" of course does involve a neutralization, and in the functionalist tradition you don't need to get caught up in any dispute as to whether it's /k/ or /g/ in such clusters: as an oppositional entity it's neither of them, as it lacks the distinctive feature in respect of which they are opposed. You are obliged to recognize a neutralization here, and establish an archiphoneme which stands in that position in place of either of the fully-featured phonemes, and you can represent this archiphoneme with a capital letter –– the UC version of either of them actually, but usually of the impressionistically more appropriate in terms of realization. That can of course, as for example with final stops in German, be much more obviously the fortis than here. @ John Cowan: I speak AmE and when I hear the unaspirated plosives of Spanish and other languages I don't hear them as /b d g/. Maybe that's because I took several years of Spanish. Maybe I've just been blessed with good ears. I do have a difficult time imitating them though. Well, when I hear them in context at least. But that's what's important anyway, isn't it? How often am I going to hear someone say tapa with no other words around it? For me these simple sounds are far more difficult than the "exotic" consonants like q, ɬ or ʕ...even though I automatically pronounce them after s.
Record yourself saying "spy," "sty," and "sky" in any sound editing program (Audacity, Wavesurfer, Praat), delete the /s/, and then see whether the result sounds like "pie, tie, kye," or "buy, die, guy." I'm a native speaker of a language where lenis consonants are fully voiced and fortis consonants are unaspirated, and mishearing e.g. a devoiced /b/ as /p/ used to be one of the most frequent sources of my misunderstanding. Now, on the other hand, I even tend to perceive unaspirated /k/ (as in syllable codas, e.g. in sulfuric acid) as /g/ until I realize that doesn't make sense. Does anyone know of a Praat or Praat-like app available for the iPhone? That is true. But the difference between "this spin" and "this bin" does seem to surface in voice-onset time, as well as in the length of the [s] sound. And even when the s and the plosive are putatively in different syllables there may be something very close to a neutralization: think about discussed and disgust. I hear "Wisconsin" being pronounced with aspirated /k/ by some speakers, and unaspirated by others. In my own speech it's unaspirated: my rule seems to be that /s/ suppresses aspiration of a following plosive unless a morpheme boundary intervene, as it does in e.g. "misplaced". I plead guilty to inconsistency in the Welsh syllabification of Ystwyth as against Aberystwyth. On the assumption that onset maximization is correct for Welsh, unlike for English, the former should be shown as [ˈə sduɨθ]. I did see that you must in principle be operating with some onset maximization criterion, and that was why I mentioned that (as of course opposed to stwɪθ) twɪθ is a phonological possibility in English, but my knowledge of Welsh is so nugatory that I was struggling to see what that onset maximization criterion was. Thanks to you for putting me out of my misery over the different treatment of Aberystwyth and Ystwyth, and to the cold light of a new day for revealing that in LPD you do intend to suggest that the t in the previous syllable can finish up as in the dʌs tə dʌs of your family funeral, by italicizing it: ˌæb ə ˈrɪst wɪθ. But you don't do this in ˈʌst wɪθ. Now that you have told me that there's no reason for any difference in the Welsh, can I assume that the difference in the English is merely because of the greater familiarity of Aberystwyth? Not that when I said twɪθ is a phonological possibility in English, accounting for aspiration in (Aber)ystwyth, I meant to imply that there had to be any. But I did consider it a possibility that needed to be accounted for, at any rate in my speech, because I usually explode t in final clusters like that before w, but don't aspirate it. 'Eastward', 'software' would be examples. I have no idea why I wanted to justify my aspiration of it in '(Aber)ystwyth'. Perhaps because I have no such greater familiarity with it. It certainly wasn't because I had ever had any illusions about the realizations of these clusters in Welsh. That's about it for me too, even though unlike Aberystwyth it's the stressed syllable which may be analyzed con or scon in accordance with the aspirated and unaspirated variants. This is what I of course meant when I said above "the presence or absence of aspiration is what pretty consistently distinguishes your pair "discussed" and "disgust", because they're not initial clusters". Neither is the sk in 'askew' 'askance' (irrespective of the uncertain morphological composition of the second). Sorry. But I think it's also of some interest that I seem to have a hierarchy of morpheme boundaries affecting this. For me the aspiration seems totally unaffected in "misplaced", which for me has secondary stress, but may well be diminished in "displaced", which doesn’t. Similarly with "miscast" as opposed to "discussed". "What other languages do it"? Note that stage 1 was inhibited after /s/ (which is why the things in the sky are stars rather than *sthars). Northern German is said to do it. Southern, lacking both aspiration and voicing, doesn't; those accents that still distinguish fortes and lenes keep this distinction completely unchanged behind fricatives. Indeed, my teachers failed to ever mention the English rule that aspiration is suppressed after /s/, so – at least in halfway careful speech – I kept the aspiration till I read about the rule a few years ago. Its equivalent was again inhibited in the High German consonant shift, which is why the things in the sky are Sterne rather than... how to even spell this hypothetical... *Schzerne. However, phonetically speaking at least, they aren't *Schderne either; the /d/ -> /t/ part of the High German consonant shift did not spare them.